Aerospace has long been at the forefront of 3D printing innovation. From its origins as a rapid prototyping tool, today additive manufacturing is used within aerospace not only for product design, but also to produce end parts as well as for maintenance operations. With the ability to create complex designs, lightweight parts and reduce production costs, 3D printing offers a range of advantages for the aerospace industry. However, key players, such as GE, Airbus, MOOG, Safran and GKN, are not only leveraging the benefits of the technology — they are also driving its development through research and development. As we continue to look into the use of 3D printing within various industries, today we’ll focus on how aerospace is leveraging the benefits of 3D printing, as well as use cases and applications. As an early adopter of 3D printing, the aerospace industry has recognised the benefits of additive manufacturing as a tool for end-part production in addition to cost-effective prototyping. Using additive manufacturing, aerospace engineers can produce prototypes without the need for expensive tooling and in a fraction of the time compared to traditional manufacturing methods. Thanks to this, additive manufacturing can also help speed up product development cycle and time-to-market for aerospace components. The freedom of design offered by additive manufacturing also makes it ideal for producing geometrically complex parts. Leveraging tools such as generative design and topology optimisation further enhances the process, by creating parts based on specific requirements. Topology optimisation can also help to reduce the weight of parts whilst nevertheless preserving their strength. Weight reduction is a key priority for aerospace manufacturers – since the lighter the aircraft, the lower its fuel consumption. Through optimised design, multiple aerospace parts can be produced as a single component, greatly simplifying the assembly process. 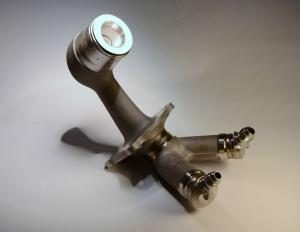 GE, for example, is now producing fuel nozzles for jet engines using additive manufacturing. Design for AM has enabled the company to bring the number of components needed down just one – significantly reducing inventory and maintenance costs. On-demand manufacturing is another benefit afforded by additive manufacturing The low-volume requirements of most aerospace applications means that it is often more economically viable to opt for additive manufacturing to produce spare and end parts. As parts can be manufactured on-demand, this significantly reduces the costs of expensive warehouse storage. Decentralised manufacturing can also significantly reduce logistics costs and create a more flexible supply chain. Due to the nature of the production process, additive manufacturing uses material more efficiently than traditional subtractive methods. With subtractive manufacturing, the Buy-to-Fly ratio — that is, the weight ratio between the raw material used for a part and the weight of the part itself — can be as high as 30:1. In contrast, additive manufacturing can reduce the Buy-to-Fly ratio to 1:1. In practice, this means significant material savings, especially since many AM technologies allow for waste reduction through recycling unused material. Aerospace companies are already using a wide variety of additive manufacturing technologies. Fused Deposition Modelling, for example, is commonly used to create prototypes and tools. French aerospace manufacturer Latécoère uses FDM for prototyping and tooling production, slashing lead times by up to 95%. In addition to this, FDM can also be used to produce end parts for aircraft interiors. For metal 3D printing, SLM, EBM and DED technologies can deliver dense metal parts with strong mechanical properties. With advancements in large-scale additive manufacturing also come innovations in methods such as WAAM for aerospace applications. As a pioneer of 3D printing technology, the aerospace industry significantly contributes to the development of AM techniques and equipment. Boeing and Oerlikon recently announced their collaboration to develop standard materials and processes for metal 3D printing, whilst GE aims to develop “the world’s largest” laser based powder bed metal 3D printer for aerospace applications. While prototypes for aerospace components can be made from a range of plastic materials, end parts for aerospace applications must meet stringent requirements. Top-quality flight-grade materials are therefore necessary to 3D print functional parts. The selection of flight-worthy materials varies, from engineering-grade thermoplastics (ULTEM 9085, ULTEM 1010, Nylon 12 FR) to metal powders (high-performance alloys, titanium, aluminium, stainless steel). Titanium is one of the most popular materials for 3D printing aerospace components, as it combines the lightness of aluminium with the strength of steel. Although titanium powders are quite expensive, the costs can be partially balanced by recycling unused material and minimising waste, which is possible with additive manufacturing. As producing tooling equipment with traditional manufacturing methods is typically a costly and time-consuming process, aerospace OEMs and suppliers have already embraced additive manufacturing as an alternative method for producing customised tools, including jigs and fixtures. The low-volume requirement for tooling applications can therefore significantly reduce both costs and lead times. Due to the difficulty of predicting demand, spare parts must typically be kept in stock for availability at short notice. 3D printing is an ideal solution for producing spare and replacement parts, as they can be produced at the point of need. On-demand, low volume 3D printing could significantly improve turnaround time for maintenance operations, reduce shipping costs and all but eliminate the need for a physical inventory of parts. An increasing number of aerospace manufacturers are turning to additive manufacturing to produce aircraft structural parts, from interior aircraft components to complex engine parts. Producing engine components is another use case for 3D printing thanks to the ability to create lightweight parts. For example, the Rocket Lab’s 3D-printed rocket engine made headlines following its successful launch last year. Almost all of its engine components (including combustion chamber, injectors, pumps, main propellant valves) were 3D printed using Electron Beam Melting technology. 3D printing can also be used for environmental control systems (ECS) ducting, oil and fuel tanks and UAV components. One of the biggest challenges faced by aerospace OEMs when implementing 3D printing technology is certification. Aircraft components must adhere to stringent regulations, with regulators tasked with ensuring that 3D-printed parts are just as safe as those manufacturing using traditional methods. Currently there are no standardised regulations for certifying additively manufactured flight hardware. However, the US Federal Aviation Administration (FAA) is already taking steps towards developing a comprehensive roadmap for additive manufacturing, including certification policies as well as research and training. In spite of this, however, there still lies the challenge of developing a complete guideline to cover all AM processes and technologies. Another challenge for aerospace OEMs is ensuring process repeatability. Qualification processes must be established in addition to designs and regulations to ensure that certifiable parts can be created on-demand using 3d printing. This could include the use of workflow automation software, such as RP Platform, to ensure that all process steps are logged and that full traceability is achieved along each stage of production. In spite of the challenges, the aerospace industry continues to pioneer the development of additive manufacturing as a viable means for end part production. Collaboration will play a key role in this development, with OEMs, government agencies and research institutions collaborating to speed up the certification process, for example. As metal 3D printing continues its meteoric growth — within the aerospace market it’s forecasted to reach $20.9 billion by 2024 — we could see even more 3D-printed metal parts within aircrafts and spaceships. There are even bold plans to build a rocket using solely 3D printing technology.